In this UC Irvine Law Review article by Kayla Crider and Jeffrey Milyo, a Professor of Social Science in the Department of Economics at the University of Missouri and Academic Advisor at the Center for Competitive Politics, the authors examine the efficacy of state ethics commissions in reducing public corruption. As Crider and Milyo note, state ethics commissions, along with so-called freedom of information acts and campaign finance and lobbying regulations, are the quintessential institutional “fixes” for political corruption that have been adopted in the states over the last several decades. Yet, there is surprisingly little evidence that institutions designed to enhance these goals actually work in practice. Instead, anti-corruption policies tend to be based more on the intuition of public administrators or self-appointed watchdogs from the press than from any systematic evaluation. In fact, despite a robust scholarly literature on the determinants and consequences of political corruption, only recently have social scientists undertaken systematic evaluation studies of state political institutions in order to test the efficacy of common anti-corruption policies. On a positive note (and in support of the intuition of many reform-minded observers), there is some evidence that methods of judicial selection and freedom of information acts really do have a significant impact on corruption rates in the states. On the other hand, there is no support for the often strongly held belief that campaign finance reforms reduce political corruption. However, to date, there has been no systematic evaluation of the effectiveness of state ethics commissions in combating public corruption. Nevertheless, the creation of state ethics commissions is generally understood by scholars to be a reaction to public concerns about corruption. Even so, there is a strong suspicion among these same scholars that such ethics commissions are inconsequential, or “toothless tiger[s].” But in the absence of any systematic attempts to evaluate the effectiveness of these commissions or their structures, the fundamental question as to whether state ethics commissions serve to reduce political corruption remains unanswered. In this study, the authors conduct the first comprehensive statistical evaluation of the efficacy of state ethics commissions as anti-corruption policy. As an initial and exploratory foray, Crider and Milyo focus on two basic hypotheses: (1) Do state ethics commissions serve to reduce political corruption? and (2) Does it matter to this end whether state ethics commissions are structured as bipartisan or non-partisan bodies? To be sure, state ethics commissions also differ in the details of appointment procedures, jurisdiction, investigative authority, manpower, and budgetary resources. However, consistent data across states and over time is sparse when it comes to these characteristics. 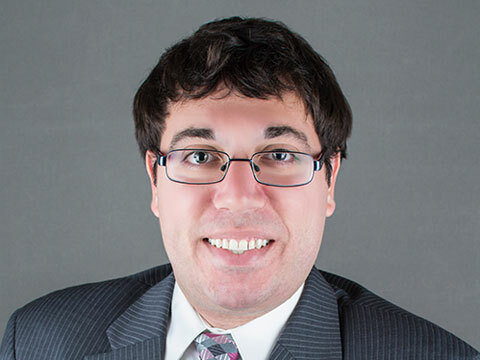 Consequently, the authors start with the more fundamental and feasible investigation of whether state ethics commissions appear to be causally related to political corruption in the states. 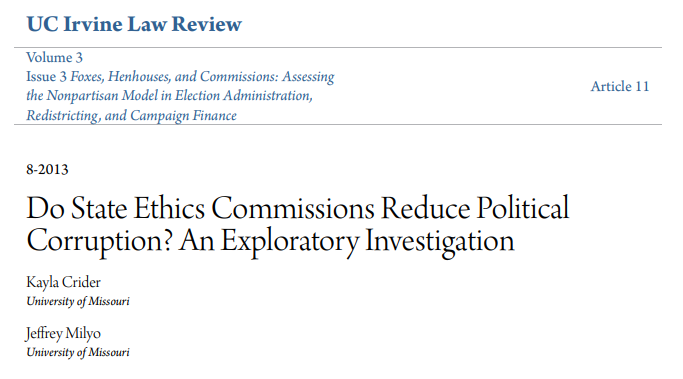 Ultimately, the authors found no strong or consistent support for the common claims made by political actors that state ethics commissions are important policy tools for reducing political corruption. Nor did they find any significant evidence that the partisan composition of these ethics watchdogs matter. Of course, it is not possible to “prove a negative”; the failure to reject the null hypothesis is not the same as proving no effect. Even so, the raw correlations and point estimates that we present indicate that state ethics commissions have only very weak, and possibly perverse, effects on public corruption. Consequently, while Crider and Milyo cannot rule out some small beneficial impact of state ethics commissions, their results do imply that this outcome is no more likely than a harmful effect of similar or larger magnitude. As such, the authors conclude that there is no support for claims that state ethics commissions, including bipartisan and non-partisan commissions, serve to reduce political corruption. Read the full law review article here.